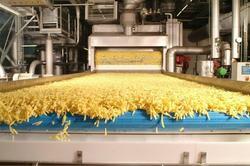 Our product range includes a wide range of frozen french fries line. This exclusive line meets the highest quality standards of Fast Food joints and other specific market demands. We offer Turn-key installation along with process know-how and technical support for project to produce Frozen French Fry. It includes process line, refrigeration system, freezer and building storage for frozen products. Flexibility of this line allows it to meet all process demands to produce French Fries of various types especially Par fried oven and Microwave as well as different cut - Plain, Crinkle, Steak, American etc.